In this new essay Shayn McCallum explores the possibilities for a genuine democratic mixed economy; one profoundly more radical that the social market approach. Debate welcome! Current debates within the European socialist movement on the way forward for the Centre-Left, often seem to be centred on the unnecessarily narrow field of “state versus market”. Much of the debate revolves around questions of the “correct ratio” of state-to-market in the provision of public goods and services, with scant attention given to the political nature of either. Where an economic vision is articulated we see labels such as “decent capitalism” or the highly traditional “social-market economy” employed. Both of these terms however, borrow heavily from a terminology, and therefore a mind-set, which is not of the Left and which unnecessarily limits and restricts the thinking of social-democratic strategists and activists. The work of George Lakoff and Drew Westen into the neuro-linguistic dimension of politics reveals a great deal that is useful in considering the current weakness of the Centre-Left and its apparent loss of creativity and direction. In accepting the essence of the liberal world-view and limiting its criticisms of the liberal project to the details rather than the over-arching vision, social-democrats have been reduced to becoming the “annoying flea” of politics, creating little more than an irritation for the continuing (neo-) liberal agenda. It has proven relatively easy for conservatives and liberals in Europe and elsewhere to dismiss social-democratic complaints about the ruthlessness of capitalism as mere faint-heartedness or an unrealistic inability to face up to “what must be done”. What is worse, the social-democratic discourse reveals that they may suspect that their neo-liberal opponents might be right after all; thus, the unsure, excessively tentative, somewhat vacuous nature of much social-democratic discourse. By adopting terms such as “good capitalism” to combat the “bad capitalism” of the neo-liberals, social-democrats are exposing themselves to the obvious response, common to both far Left and Centre-Right, that really “there is just capitalism” and adjectives such as “good” and “bad” are irrelevant or misplaced. For the hard-core economists of the Right, as much as the more economistic voices on the hard Left, speaking of “good” and “bad” capitalism makes as much sense as speaking of “good” or “bad” gravity or “good” or “bad” oxygen. The term is weak, ineffective and unambitious and fails to offer more than a limp moral critique of the system as it is. In fact, the charming vision of a virtuous, industrious society re-enshrined in the virtuous “real economy” of manufacturing and productive industry is not only a fantasy, it is, in many ways, a reactionary one at that. When ecological collapse is looming right behind the collapse of the unbalanced and excessive, increasingly-consumption driven, global economic system, producing yet more “stuff” is probably not the optimum way forward from where we are now. Short-sighted, populist attempts to revive the industrial revolution in the wealthy nations makes as much sense as trying to stop the Titanic from sinking by making the orchestra play more slowly. The era of unsustainable industrial growth, at least in the first-wave of industrialised nations, belongs to the past not to the future and this is, perhaps, one thing the “neo-social democrats” have got right. The state we are in demands a much bolder response than a nostalgic appeal to the good old days of industrial growth. Terms such as “decent capitalism” or even the “social-market economy” are flawed, in that they create a conceptual framework that is inseparable from, and therefore unable to move beyond the basic framework of the existing system. In contrast, by adopting terms such as “economic democracy” or even “a democratic mixed economy” socialists would have the means to open up this currently truncated and inhibited conceptual framework and, potentially, take back control of the dominant discourse. Where capitalism, whether “good” or “bad”, is defined by certain structures and institutions that cannot, even must not be transcended or interfered with for fear of undermining the system itself (once the central goal of socialists not so very long ago) terms such as a “democratic mixed economy” at least open the door to the possibility of transcending the flawed logic of capitalism and “the market economy” altogether. Not only “capitalism”, which, it should be pointed out, is a term originally coined by critics of the system and which has only recently been embraced by its aficionados, but also the term “market economy” (whether social or not) is a conceptual prison. The Delors-era social-democratic slogan of “we want a market economy, not a market society” is reminiscent of a caricature of a man being devoured by a tiger and, whilst half-engulfed in the tiger’s maw, pleads with the creature to eat only his lower half and no more. A market economy, in the sense implied by liberal theory, cannot but lead to a market society. A “mixed” economy however, at least conceptually, has the potential of being a society “with markets” without necessarily being dominated by them. Just to frame this concept so it can emerge from the level of rhetoric to the level of a concrete example, economic history reveals a myriad of examples of economic systems which employed markets without being dominated by them and without exchange and commerce occupying the central place in economic life. Indeed, for much of human history, commerce has existed as one among many forms of economic activity and it is only in the modern age that it has acquired such a uniquely pervasive influence. Feudal economies, for example, were essentially war-driven economies based on the control of land and commerce remained a highly secondary pursuit. Merchants were tolerated and or encouraged as a means to an end and it wasn’t until the vast influx of wealth from the new world, from the 1500’s on, began to undermine the feudal power structure and grant the rising merchant class a significant degree of political influence that the road to modern capitalism was opened. Likewise, in the Islamic Middle-East, trade was an important pursuit and markets held an important place in the life of the cities yet, even here, the dominant economic engine was the demands of a militarised state. There was no market economy to be found in the Middle-East, although very sophisticated markets played an important role in the urban economic order. No matter how important markets may have been to pre-modern economies, these were always merely one part, mostly a subordinate part, of the broader economic and political context. As Polanyi points out, economic relations are always embedded in (and have been historically subject to) broader social and political contexts. Capitalism therefore, may be perceived as an attempt to dis-embed the economy and grant it a central, autonomous and superior role in the construction and maintenance of society. This is, however (according to Polanyi at least, and history is yet to prove him wrong) an unworkable fantasy. The idea of the self-regulating market is just as mythical and untenable as the idea of a fully-planned, efficient communist paradise. In reality, all economies embody a variety of co-existing production and distribution systems and most have varied property forms. Even the most “capitalistic” economies, such as the U.S., clearly demonstrate these variances. The state and large corporations are intertwined in ways that make a mockery of Smith’s “invisible hand”. Capitalism, in short, means “the rule of capital” and markets are merely a vehicle to be used when profitable and to be ignored whenever a liability. This definition of capitalism permits the, otherwise absurd, position of advocating free markets against capitalism. This highly optimistic approach can be found in the works of David Korten and the theory of mutualism associated with Pierre-Joseph Proudhon, together with various theories of “market socialism”. Indeed, there are a number of political approaches which separate the market as a mechanism from the rule of capital. Although this “socialist reading of Adam Smith” is perhaps naïve and overly rooted in a near extinct class of smallholder artisans, farmers and entrepreneurs, the idea of a separation of the market from the rule of capital, although problematic, is not totally unreasonable as the existence of socially-embedded market mechanisms long precede the emergence of the capitalist political economy. As has been mentioned above, the self-regulating market is an ideological fantasy and does not approach the reality of capitalism which is increasingly exercised through highly-organised, bureaucratic trans-national corporations that employ markets as a tool. The problem of “markets against capitalism” however, is that the competition inherent to a market system inevitably creates winners and losers and leads to an evolutionary dynamic that, in a very short period of time, undermines the basis of the market itself (which is the essence of Polanyi’s critique of free-market ideology). A market-centred economy, regardless of its ideological foundations, appears inevitably to tend to support the emergence of capitalism at some point (a process somewhat demonstrated by real-world attempts to implement “market socialism”). 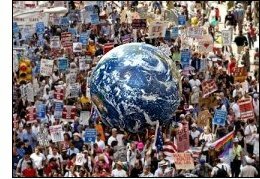 Capitalism therefore, defined as the “rule of capital”, is, in every sense, at odds with popular sovereignty. If social-democrats accept “decent capitalism” as a goal, they are essentially pleading for capital to be decent as they are not capable of advancing any meaningful counter-power, such as powerful, well-organised trade-unions or citizens’ alliances to ensure this. In fact, the “decent capitalism” of the post-war Keynesian era, that forms the basis for this vision, was “decent” precisely because capitalism was compromised and partly balanced by a rising wave of democratisation. This democratic revolution was, unfortunately, undermined by circumstances and partially abandoned in the late 1970’s, at which point the neo-liberal counter-revolution seized the initiative. After WWII, capitalism was forced into an open-ended compromise with democracy, from the 1980’s onwards it has been busy undoing the bonds imposed by that era. Just as it is impossible to serve two masters, it is also impossible to simultaneously uphold the power of capital and the sovereignty of the people. The unsatisfactory compromise offered by liberalism is to separate the political from the economic, leaving the economy to the abstraction known as the market (in truth, organised corporate interests) whilst parliaments elected by the people handle what remains of the political. In short, according to the theory, the “market” will see to employment, prices, wages and the distribution of essential and non-essential goods and services, whilst “democracy” need content itself with rulings on issues such as the permissibility of gay marriage, the criminalisation of flag-burning, gun ownership, abortion or other details of the social, cultural and political milieu. In such an environment, politics becomes a matter of flavour and preference with cultural issues substituting for questions of class power, redistribution or the provision of social goods and services. That social-democrats have allowed themselves to be led down this path is a sad indictment of the robustness of socialist thought and strategy in the current era. As Thomas Meyer points out, economic issues, issues of public welfare and economic justice give democracy its substance. If the liberal celebration of “negative freedom” (i.e. “freedom from” as opposed to “positive freedom” being the “freedom to” act or access something) leads to little more than the “freedom” to be unemployed, homeless, ignorant or uninsured, there is good reason for adopting a more balanced and sober attitude. There is no point speaking of “freedom” unless people have the basis on which to enjoy that freedom and this can only be assured politically, by means of an active, participatory democracy that embraces all areas of public life. Thomas Meyer roots his approach to social-democracy in the U.N. Universal Declaration of Human Rights and there is some merit in referring to this document. The Declaration attempts not to align itself overtly with any particular political or economic theory or ideology although it is quite explicit in its advocacy of a political and social democracy entailing a raft of full social and political rights. Indeed, the resulting document proves, in its fundamentals, incompatible with either capitalism or communism (as practised in the Soviet Bloc or China) but highly compatible with either democratic socialism or social-liberalism and, indeed, it was on this terrain that the post-war Western European political order was established. The emergent order was a compromise between socialism and capitalism which, although capitalism was always the dominant force, arguably also contained the (historically unrealised) potential also to evolve in a more socialist direction. It is worthwhile remembering that liberals such as Keynes, although by no means socialists, were also very much disenchanted with capitalism, although they grudgingly tolerated its continuation as the least-bad of the available alternatives. The aim of Keynesian demand-management was the general welfare and it saw capitalism as a tool, a means rather than an end. 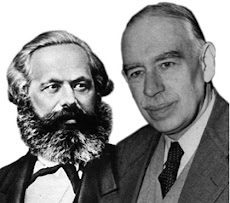 Keynes’ economics were, therefore open-ended and evolutionary and, arguably, contained the seeds equally of what could become either a democratic socialist or a social-liberal approach. Although the benign capitalism of the “social market economy” may have resembled, in practice, the social-democratic ideal of a “democratic mixed economy” in truth the intentions were, and are, different. The social market may be “social” but the market is the indispensable, central mechanism of the economy, albeit modified where necessary by the need for a degree of social justice (again, to the degree that it does not “distort” the market mechanism). The “democratic mixed economy” however is an open-ended evolutionary project which stresses democracy as its primary feature. Its goal is not mere benevolent capitalism but a terrain on which new, emancipatory forms of property and production are able to evolve and emerge. It does not seek to overthrow capitalism in a frontal assault, nor necessarily to entirely eliminate market mechanisms from the economy, but rather to tame them, then subordinate them to the general good where possible. The difference, in brief, is that the “social market” is conceptually rooted in the market and therefore limited by the demands of the market whereas a “democratic mixed economy” is conceptually rooted in, and limited by, the demands of democracy and social justice. In the former, the limits of the social are determined by the market whereas, in the latter, the limits of the market are determined by the social. Of course, in the real world, assuming the basis for a new compromise could be created, there would be a competition in politics between the visions of the “democratic economy” and the “social-market” which was, indeed, the ideological cleavage separating the Centre-Right and Centre-Left in the post-war Western European political economy. The democratic Left begins from the assumption that its own vision must be fought for amidst a plurality of competing visions and approaches. Any democratic political project must be open-ended and subject to both advances and reversals. It is a pity that the large sections of the Centre-Left abandoned its own vision before it had even achieved the bulk of its goals, although there is still a chance it will find its way back home. At this point, it is perhaps appropriate to remember the approach of Eduard Bernstein for whom the “movement (was) everything, the end nothing”. The end, for modern socialists, is perhaps not “nothing”, in that it helps to have a landmark in the distance by which we can measure our progress, although, the nature of social-evolution is such that there usually is no identifiable end that can be discerned as one victory endlessly opens the path to new struggles. The goal of the Centre-Left therefore ought to be to ensure that the direction of evolution be towards greater freedom, equality and solidarity. Getting trapped in the historical cul-de-sacs of specific systems or institutional frameworks, whether it be “state-socialism” or “decent capitalism”, is the passport to extinction. Socialists need to imitate life itself and embrace constant evolution, but they must never forget the direction they wish to evolve in if they are to avoid the fate of the dinosaurs and dodos of the past. In time, terms such as “democratic mixed economy” are bound to pass their use-by date and develop into hidebound clichés as reality continues to extend its limits and social-democrats, if they are even continuing to call themselves by that name by then, will once again need to adapt or die, but always, hopefully, on the path to ever more democracy, ever more equality, liberty and fraternity. This is also mentioned by Polanyi but also widely commented on by a very wide range of other sources positioned on all points of the political spectrum. It was even acknowledged by former U.S. president Dwight D. Eisenhower in his musings on the “military-industrial complex”. David Korten is a leading proponent of a non-capitalist market economy. Most of his work embraces the central contention that capitalism is actually not a market system and that a “true” market economy is the solution. In many respects, his work is reminiscent of classical Proudhonian mutualism. Examples of this may be cited as the collapse of Yugoslav market socialism as well as the rather makeshift “goulash socialism” of communist Hungary but also the feeble market reforms of perestroika or state-capitalism of China and Vietnam. It remains to be seen how the emerging reforms in Cuba are likely to take shape. The distinction between “positive” and “negative” freedoms here are based on the categories introduced by Sir Isaiah Berlin in his famous essay Two Concepts of Liberty.